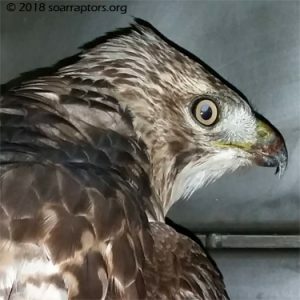 A call about this HY18 red-tailed hawk came thanks to one of our personal veterinarians! The landowners reported seeing this hawk at the back of their property for a couple days and called their vet clinic for help. He is very thin and has some bumps and bruises. The right foot, outside toe does not move and the foot is swollen. Because of the toe / foot injury, Kay is suspecting electrocution. This hawk did lose toe #4 on his right foot, but is doing well in spite of that.